I'm a huge fan of Joël Penkman’s work. 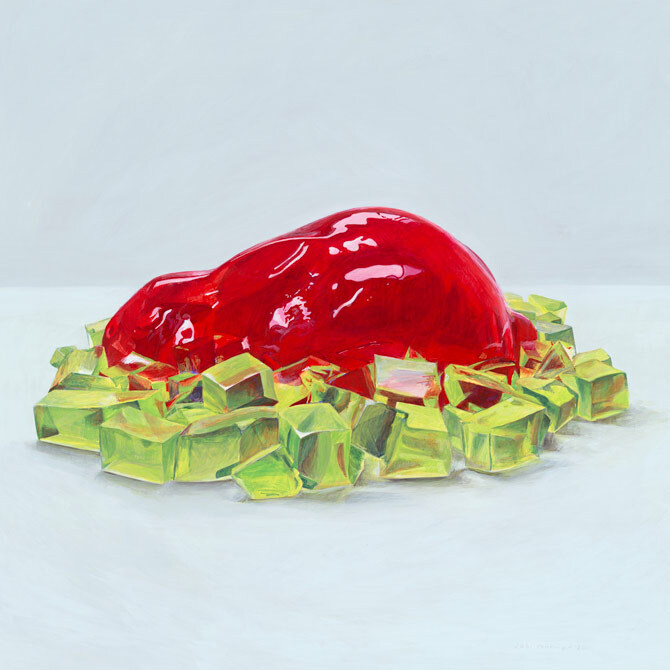 Quite frankly, it’s difficult for me to take my eyes of her colorful food paintings. 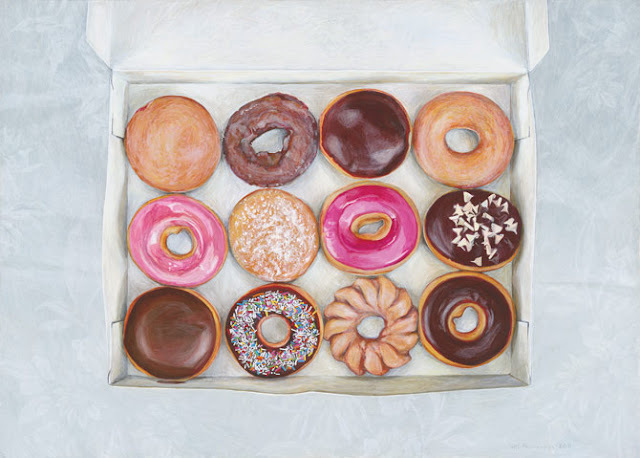 There is something really beautiful about the way she paints a jelly rabbit or a box of Krispy Kreme donuts, something lovely about their simplicity. I think my favorite piece is Blackpool Rock. It brings back such great memories of childhood and makes me hungry, all at the same time! You can find more of Joël’s work on her website, right here. You can also click here to visit her Etsy shop and order prints online. 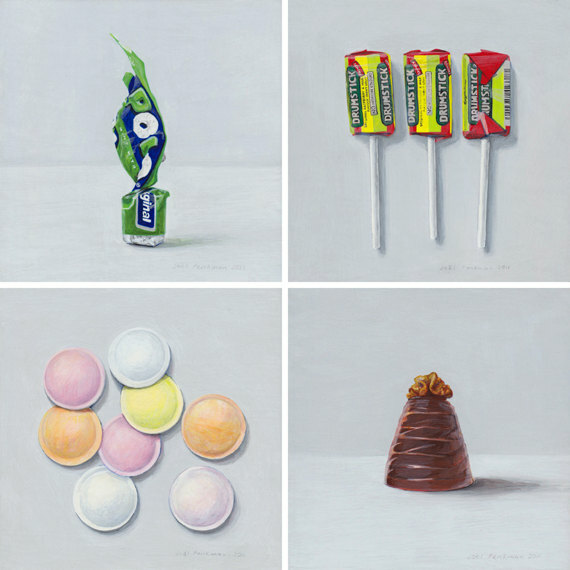 I guarantee that looking at her paintings will instantly brighten up your day! Thanks, Joël! 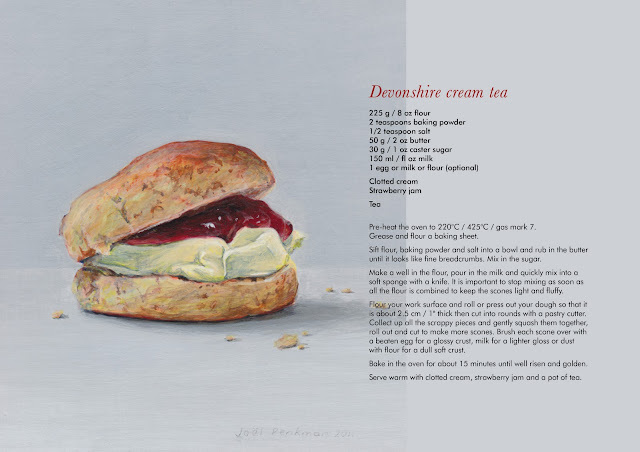 For a text version of the Devonshire Cream Tea recipe, and to see more Joël Penkman images, click Read More below. Pre-heat the oven to 220°C / 425°C / gas mark 7. Sift flour, baking powder and salt into a bowl and rub in the butter until it looks like fine breadcrumbs. Mix in the sugar. Make a well in the flour, pour in the milk and quickly mix into a soft sponge with a knife. It is important to stop mixing as soon as all the flour is combined to keep the scones light and fluffy. Flour your work surface and roll or press out your dough so that it is about 2.5 cm / 1" thick then cut into rounds with a pastry cutter. 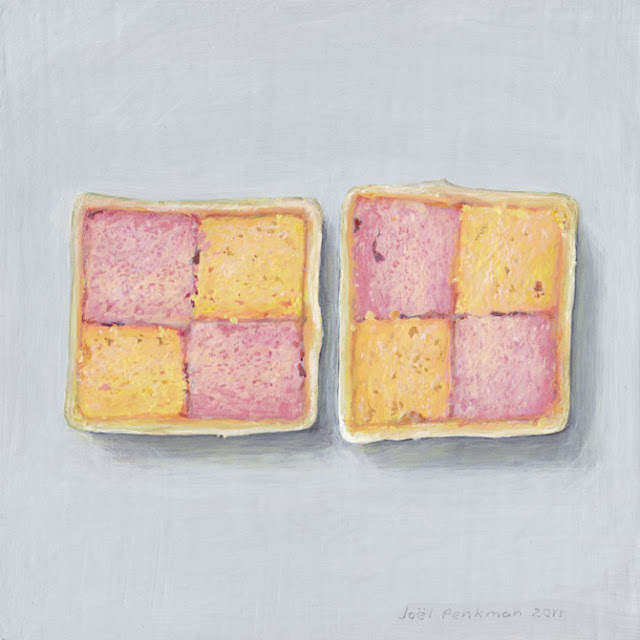 Collect up all the scrappy pieces and gently squash them together, roll out and cut to make more scones. Brush each scone over with a beaten egg for a glossy crust, milk for a lighter gloss or dust with flour for a dull soft crust. Bake in the oven for about 15 minutes until well risen and golden. Serve warm with clotted cream, strawberry jam and a pot of tea. What a great find. 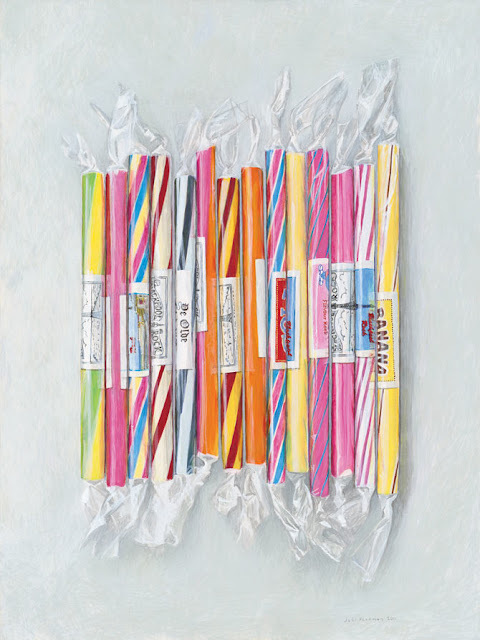 I especially love the candy cane painting. They're gorgeous-and with some of them it's hard to tell if they are painting or photos they're that accurate! Wow! What awesome pictures! I nominated you for a Versatile Bloggers Award. Please see my post today. Thanks! Thanks, Karyl! I'm so glad that you like my site! 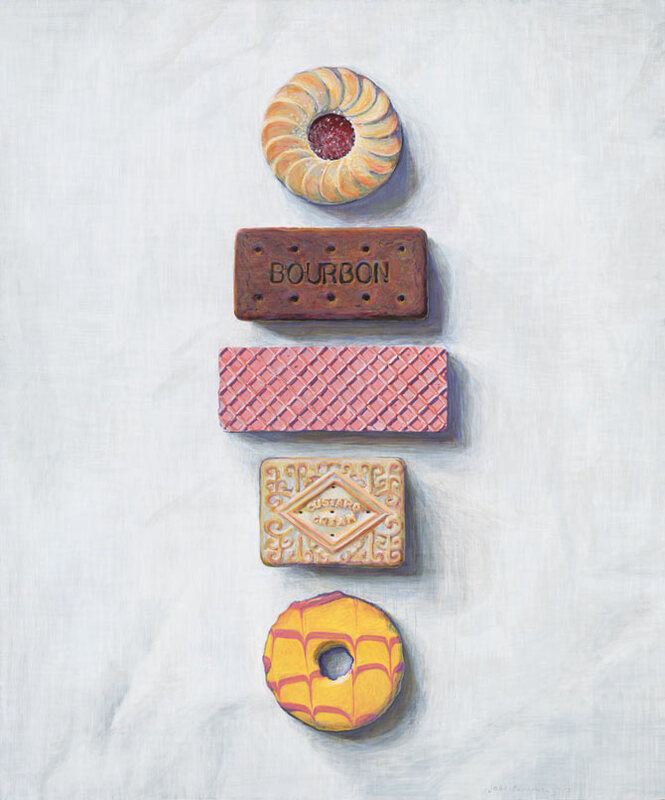 Those food illustrations are lovely. You have a lovely space here. Do drop by mine sometimes.